This is our windsock solution where ICAO compliance and internal illumination are required, consisting of a Windsock Frame rotating about Internal Illumination. 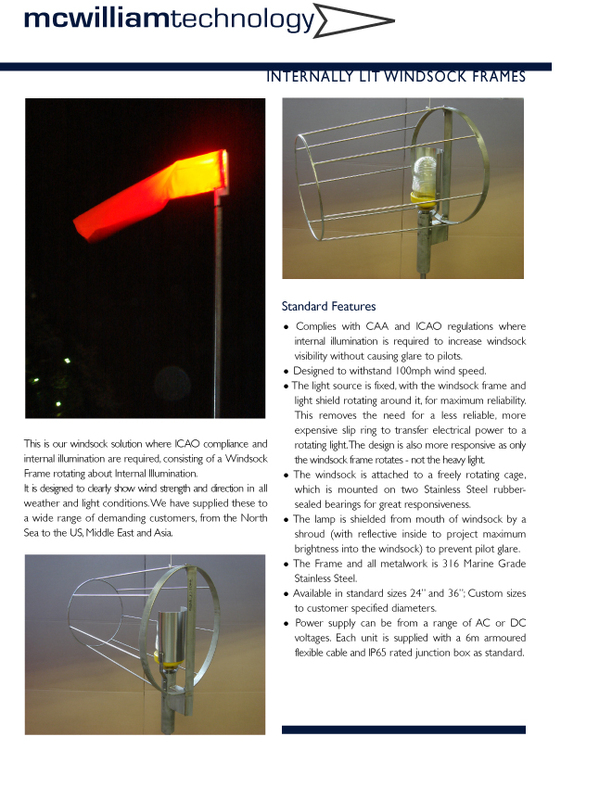 It is designed to clearly show wind strength and direction in all weather and light conditions. We have supplied these to a wide range of demanding customers, from the North Sea to the US, Middle East and Asia. • Complies with CAA and ICAO regulations where internal illumination is required to increase windsock visibility without causing glare to pilots. • Designed to withstand 100mph wind speed. • The light source is fixed, with the windsock frame and light shield rotating around it, for maximum reliability. This removes the need for a less reliable, more expensive slip ring to transfer electrical power to a rotating light. The design is also more responsive as only the windsock frame rotates - not the heavy light. on two Stainless Steel rubber-sealed bearings for great responsiveness. • The lamp is shielded from mouth of windsock by a shroud (with reflective inside to project maximum brightness into the windsock) to prevent pilot glare. • The Frame and all metalwork is 316 Marine Grade Stainless Steel. • Available in standard sizes 24” and 36”; Custom sizes to customer specified diameters. • Power supply 240 VAC or 110 VAC. Each unit is supplied with a 6m armoured flexible cable and IP65 rated junction box as standard. • Made from Day - Glow orange polyester, longer lasting than nylon or cotton. • Standard type is 3.6m / 12ft long for 36” model, 2.1m / 7ft for 24” model. • LED Illumination and / or Obstruction Light. sufficient solar and wind power. photocell, RCBO and 3 way switches to allow a utomatic control via photocell or manual override.